The Rams aren’t exactly known as a winning franchise. In fact, they’ve only won three championships across three cities (Cleveland, Los Angeles and St. Louis) in their 80-year history. Unfortunately, we’re not here to talk about any of those times today. We’re here to talk about the only Super Bowl the team ever played in while living in Los Angeles–a 31-19 loss to the Steelers in Super Bowl XIV. First of all, the Rams weren’t actually that good in 1979. They weren’t horrible, but their 9-7 finish doesn’t exactly make them the 1972 dolphins or the 1985 Bears. They were fortunate to have played in a pretty week NFC West that season, and their only real stiff competition was the 8-8 Saints. The division was rounded out by the 6-10 Falcons and the pitiful 2-14 49ers (Joe Montana was a rookie that year and only got a handful of snaps). They still played competitive football, but they definitely had to fight for their right to party most Sundays. As I mentioned earlier, the Rams weren’t exactly a title contender from the outset of the season. Offensively, head coach Ray Malavasi had a crew that, at least in 1979, wasn’t all that impressive. Sure, they had Hall-of-Fame Tackle Jackie Slater on the line, as well as several Pro-Bowlers (Dennis Harrah, Rich Saul) and future multi-time Pro-Bowlers (Kent Hill, Doug Smith), but those guys didn’t have a whole lot of talent to protect out there. For one, the Quarterback situation was in total disarray all season long. Pat Haden, a fourth year veteran out of USC, started the first ten games of the season, and the results were mixed. The Rams started 4-2, but then lost three games in a row, before beating the Seahawks 24-0 in Week 10. Unfortunately, Haden broke his finger in that game, and his season was done. They started Jeff Rutledge in Week 11, but the rookie out of Alabama struggled mightily in a loss. In Week 12, the Rams made their best decision of the season, naming Vince Ferragamo the starter. Ferragamo started the rest of the way, but threw 5 TDs and 10 INTs overall. The three, along with Bob Lee, (who was also used as a backup during the season combined to go 240/454 (53%) for 3,000 yards, 19 TDs and 29 INTs. That’s not exactly Super Bowl material, right? Well, no one else on the Rams’ offense was exactly ring-inspiring either. Carries were split between startin RB Wendell Tyler and FB Cullen Bryant. Those two, along with a few other bit players, combined for 2,460 yards and 16 TDs on the ground. That total looks a whole lot better than the sum of its parts, as Tyler led the team with just 218 carries and 1,125 yards. That’s not bad, but, again, not quite what you’d expect from a Super Bowl team. Their leading receiver, Preston Dennard, only had 43 catches for 766 yards and 4 scores. All of those numbers were good enough to pace the team. I guess it’s hard to have a standout receiver when you’re pulling guys off the soup line to play QB, though. Anyway, the Rams still managed to be in the middle of the pack offensively, finishing 15th out of 28 teams in scoring. Defensively, the Rams had a bit more of a solid foundation. They finished 11th in the league in points allowed (309), and did so on the backs of guys like Hall-of-Famer Jack Youngblood (who played in the playoffs with a broken fibula), and Pro-Bowlers like Larry Brooks, Jim Youngblood (somehow, not related to Jack), and future Pro-Bowlers Jack Reynolds, Pat Thomas, Rod Perry, Nolan Cromwell. You just knew those guys were capable of, if not winning games outright, at least keeping hope alive for 60 minutes every Sunday. As you may have guessed by the 9-7 record, and the fluctuating QB situation, the 1979 season was a real grind for the Rams. As I mentioned, the Rams were 5-5 heading into Week 11 when their starting QB was hurt. They lost Week 11 with Rutledge at the helm, but things turned right around once Ferragamo behind center. The first-time starter led the Rams to a 4-1 finish with wins over the Falcons, 49ers, Vikings and the Falcons again. He lost to the Saints in the last week of the season, but the division was already clinched by the, so it didn’t matter. The Rams drew the Cowboys in Dallas for the opening round of the post-season, and ended up winning a thriller with a late 50-yard TD pass to Billy Waddy from Ferragamo, who threw for 3 TDs in the game overall. The Rams won 21-19, sending the great Roger Staubach off to retirement in the process. The NFC title game against the Buccaneers, meanwhile, has to be one of the ugliest games in NFL playoffs history. Both defenses were on point in the matchup, but the Rams’ D was simply masterful, shutting out the Buccs. The offense got far enough down the field for three Frank Corral field goals, and Los Angeles gained it’s berth into Super Bowl XIV with a 9-0 win. On Super Bowl Sunday, in front of a home town crowd because the Super Bowl was, coincidentally, being played at the Rose Bowl in Pasadena that year, the Rams matched up against another future Hall-of-Famer… the great “T.B.,” Terry Bradshaw. Bradshaw was beginning to wind down his career, but looking to add a fourth ring to his already super heavy hand (see what I did there?). The upstart Rams, meanwhile, were just hoping to play spoiler against the heavily favored Steelers. The first half was a very competitive back-and-forth affair. A Matt Bahr field goal put the Steelers up 3-0, but a Cullen Bryant TD run and PAT gave the Rams the lead heading into the second quarter. 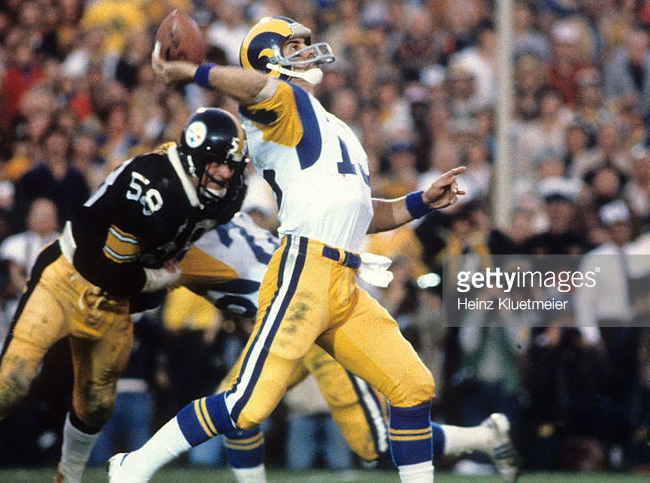 The great Franco Harris ran one in to put the Steelers back up 10-7, but two more Frank Corral field goals saw the Rams take a 13-10 lead into the break. Bradshaw came out gunning in the second half, and a 47-yard TD pass to the great Lynn Swann put the Steelers back up 17-13. The fighting Rams would not be denied, and a trick play saw RB Lawrence McCutcheon throw a 24-yard TD pass to Ron Smith to put L.A. back up 19-17 heading into the fourth quarter. Unfortunately, the Steelers were a seasoned team with plenty of Super Bowl experience, and that helped them really take over the game late. Bradshaw hit John Stallworth (what a team the Steelers had, btw. sheesh!) on a 73-yard bomb to give the Steelers the 24-17 lead, and they would eventually add another rushing score from Harris to finally put the Rams down for good and cap their 1970s dynasty with yet another Lombardi Trophy for their case in Pittsburgh. The game is widely considered to be a real classic. A hell of a game. It was a good effort for L.A., but it was simply not meant to be. The Steelers were just too damn good. The Rams certainly didn’t embarrass themselves, and they left that game with plenty of hope for the future. In Ferragamo, they saw hopes of future Super Bowl championships to come. Unfortunately, those never came. They’d finish 11-4 the next season, running away with the division, but they sputtered in the first round of the playoffs against Dallas. Ferragamo left for some legit CFL money in 1981, so that ruined 1981. He returned a year later, leading the Rams to the playoffs in 1983 on the back of rookie RB Eric Dickerson, but again sputtered. By the late 80s and early 90s, the team was a disaster, and eventually moved to St. Louis, where Kurt Warner finally led them to a Super Bowl win. Womp. Will Los Angeles Rams ever see another Super Bowl? Probably not with their current team, but success is always just a rebuild away. I wish them well. Feel free to watch the entire game on Youtube… while it lasts!